Deep linking has become a very hot topic within mobile recently and advertisers have begun inquiring about the differences with deep linking in mobile web versus in-app campaigns. The concept of deep linking, or taking a user directly to a specific location or page rather than the home page, has been around for about as long as the web itself and is second nature to most of us. For example, if I wanted to send you an article on Yahoo, I would send you a URL that immediately brought you to the article, not send you to the Yahoo.com main portal to navigate to it yourself from there. Deep linking to specific pages on the mobile web works exactly the same as it has on desktop for the past two decades. In order for deep linking to work, the target app first has to be set up using the proper protocols, which is relatively simple and must be done for any deep linking to an app to work, whether from the mobile web, the Facebook app, etc., and most popular apps should already be set up in such a way. 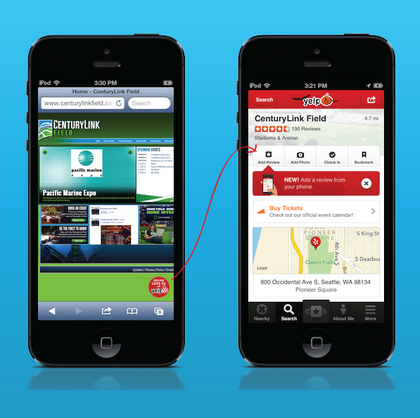 The advertiser must then provide the deep link to the specific location within the app they want as the destination. These URI (Uniform Resource Identifiers, of which URLs are a subset) formats will vary based on OS but look something like Yelp://12345. For more information on the technical aspects of deep linking, see here. As you can see, deep linking from ads in-app is no problem, but we have to take an extra step. In the mobile web, the main issue is that we can’t detect if a user has the target app installed ahead of time. The operating system/browser will display an automatic error message (or do nothing at all) if the user does not have the app installed. 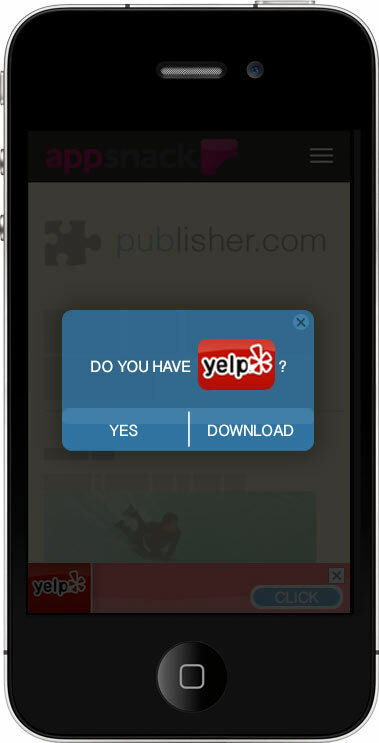 Alternatively, the banner or expanded ad unit could have two CTAs – one taking the user to the relevant page in the Yelp app and the other the Yelp page in the app store. As we continue to expand our in-app inventory, this is currently our best option for successfully being able to work with advertisers to send users to deep links within apps on mobile devices.